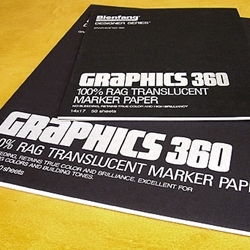 Graphics 360 Translucent Marker Paper - This is the classic, 100% rag, professional grade marker paper. No bleeding; retains true marker color and brilliance. Excellent for blending colors and building tones. Translucent enough to be able to trace preliminary designs. Brilliant white color allows your marker colors to show beautifully!